You are here: Home / Songwriting Tips / Do Lyrics Have To Rhyme? Common Myths Broken Down! Do Lyrics Have To Rhyme? Common Myths Broken Down! When it comes to songwriting, I’m often asked if lyrics have to rhyme. After all, a big emphasis is usually made on how good your rhymes are, especially in the rap genre. The truth is however, no, your lyrics don’t have to rhyme. It’s perfectly possible to make a good song without any of your lyrics rhyming. Let me explain. Early Disclaimer: I’m not saying you shouldn’t rhyme any of your lyrics, as rhyming does play a big part in creating catchy songs. That said, there is another way to effectively create good lyrics, which is what I hope to highlight in this guide. When you first start out song writing, you’re often advised to rhyme your first line with the second. After you’ve written your first line, see what the last word is, and find a word that rhymes. Make that the last word of the second line. It gives beginners a easy way to learn basic lyric structure. It’s what the ‘teacher’ was also taught, so they pass on the same advice. While this can help you get used to writing a song and get some catchy lyrics under your belt, it’s not the only way to do things. 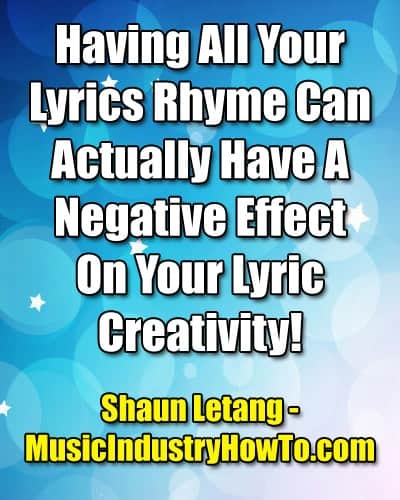 Having all your lyrics rhyme can actually have a negative effect on your lyric creativity! – Tweet This. Why is this? Simple, because you’re limiting the type of lyrics you can write. There are only so many words you can rhyme with ‘Friday night’, so if you use this word string at the end of one of your lyrics, there will only be so many ways you can end the next line. This predictability can work well for some tunes, for example if you’ve a commercial song which you want to be easy to pick up so people can sing along to it. If however you’re trying to stand out from the crowd and get yourself noticed as being someone different and creative, you’re going to want to take a different path. And if all of your lyrics sound like they could’ve been written by 1000 other people, this isn’t doing your unique image any favors. In addition to this, having all your lyrics rhyming can make your songs sound basic or even childish. If you’re aiming your music at a young audience, this could actually be a good thing. If you’re not however, you’ll want to steer clear of this. So what can you do to make your lyric writing stand out from the crowd? Read on for all the info. Regardless of whether or not your lyrics rhyme, they should ‘flow’. The reason why lyrics which rhyme often sound good to the ear, is because they flow well together. They sound easy on the ear, and therefore makes a nice sounding song. It is however possible to make your songs flow along without rhyming each final word on each line. Like why are we here, and where do we go, and how come it’s so hard? I’ll tell you one thing: It’s always better when we’re together. As you can see, not one word in that part of the lyric rhymes. That said, it does sound right when he sings it, and it flows together well. It doesn’t sound uneasy on the ear, and it’s relevant to what he’s talking about. Think about it, if you wasn’t tied down to rhyming certain words together, how many more things could you say in your lyrics? Wouldn’t your bars make a lot more sense as you can simply say what you wanted rather then having to find a word to rhyme with it? Not being restricted by rhyming all of your song lyrics can really help with your songwriting creativity, so once you’ve passed the basic lyric writing stage, try adding song lines which don’t rhyme but flow instead. This will really step your writing game up. So do lyrics have to rhyme? No, they don’t! What’s more important is making your lyrics flow well together, and not sounding uneasy on the ears. 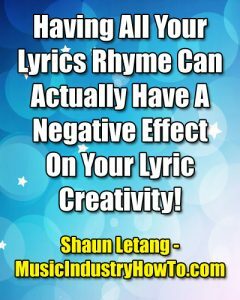 Of course rhyming is still a useful part of songwriting, but overusing it can make your lyrics sound childish and basic. So get a healthy balance in. I’d love to hear your thoughts on the matter; Do all your lyrics rhyme? Or do you switch it up? Let us know in the comments section below. 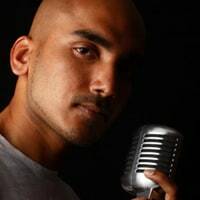 How To Write Good Rap Lyrics, Advice For Writing Better!